There is something just glorious about a plate of meat. Seriously. It’s the best. 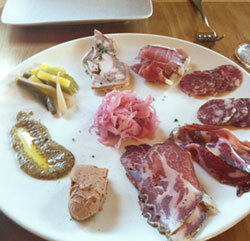 And if you aren’t ordering the charcuterie plate at your favorite Twin Cities restaurant, you’re missing out. 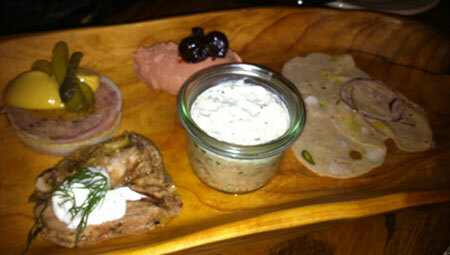 This week it was Haute Dish (below), where they call their platter the Char-Cuts (Yar!). For $13 you get one of the most creative, magnificant platters of meat I’ve ever enjoyed. The white jar is rabbit rillette, juicy and delicious, and the white-colored stuff on top is a mustard. Amazing. There’s a really flavorful mortadella with pistachios and dehydrated red onions, a lamb terrine with eggplant, a chicken liver pate with brandied cherries, and a country pork pate had really spicy mustard. It was spectacular. Before that I was at Heartland in St. Paul, just a wonderful place to sit down at the bar, have a small plate and a cocktail, and think big thoughts. 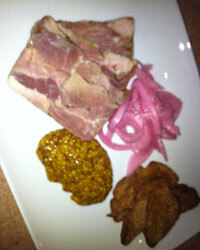 We had pork head cheese (they call it fromage de tete) with pickled red onions. It was not gelatainous like some of the head cheese you might remember from your childhood; it was so flavorful and porky, and $12. (Right now they’re doing a wild boar head cheese). And I also am showing you a more traditional, but truly lovely charcuterie from Mike Phillips at Craftsman. I have no idea what the charcuterie will be like under new Chef Ben Jacoby (who told City Pages that Mike took all the knowledge and the salami-making equipment with him), but I’m glad I got to enjoy these salamis and coppas and everything ($15) before he went. Dara’s written about Mike’s plans for Green Ox, where he’ll be working with Kieran Follierd’s Irish pubs to create meats and sausages. It’s going to be amazing. As a salami-lover, I can’t believe I’ve been missing out on ordering some of these incredible plates o’meat until about a year ago. Now if I see one on a menu, I almost never skip it. Where are some of your favorite places for charcuterie?